Schedule everything from your Regular/Daily Tasks to those Periodical Tasks so that your team never miss a thing. Schedule Tasks in either daily, weekly, to specific days each week, periodically across the month and onto specific Visits. Your client will never need to question whether that monthly task has been completed. Your team will no longer overlook or forget to perform a task. Even use Tasks to ensure team members complete security and safety measures. Tasks can also be commented on by your team, if they were not completed, so that you no longer have to call them to find out why they didn’t do something. Set Alerts to notify if specific Tasks aren’t completed. Create & Schedule Tasks to reflect your Scope of Works or Simply the important Critical Tasks you want to ensure your team complete. Help your Team learn in the Field. Upload Instructions or Standard Operating Procedures on how to complete a Specific Task, so that the team have access to them every time that Task is due. Expand on written SOP’s by linking to You Tube Content about how to complete a Task, so that your team can simple watch it from their mobile device. 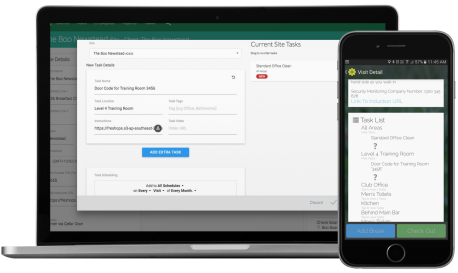 Create Task Templates so that you can use them over and over again ensuring across all your Sites, Tasks are performed in the same way. When you update a procedure, change a chemical range etc, update the SOP in the Task Template and have that procedure update across the whole business.